Kubota recently launched the RT plus horizontal engine range and an upgrade of their horizontal engine line. Kubota RT plus horizontal engines are available in three models: 10, 12.5 and 14 horse power. 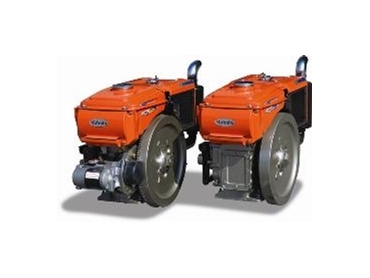 Kubota RT plus horizontal engines are available in manual and electric start variants and offer improved durability and fuel efficiency when used for applications such as water pumps, generators and water propulsion. They will be released for sale in Australia in the second half of the year. A direct injection combustion system is common to all Kubota RT plus horizontal engines, providing increased horsepower and better fuel efficiency. The highly efficient DI system injects fuel into the combustion chamber resulting in heat and pressure that becomes the driving force of the piston head. In order to provide an accurate mixture of air and fuel, and for air to swirl quickly and smoothly, the pistons in Kubota RT plus horizontal engines have a deep troidal bowl design. The end combustion process improves the output of the engine and provides higher levels of torque when operating at low RPM. All Kubota RT plus horizontal engines feature a new multi injection port that adds an extra nozzle sprayer and decreases the size of the injector puncture to so that it works with the high efficiency injection pump. This results in the pressure of up to 220 kg/cm. Because fuel is broken down into small particles and spread evenly to reach all combustion spots, complete combustion is achieved and air pollution is reduced. Engine valves — stainless steel valves introduced that are more tolerant to heat and corrosion. Engine pulley and belt — enhanced to reduce friction between the fan belt and engine pulley. Fuel tank — fuel tank base fixing bolt size increased by 30% to help them maintain tension. Filter element — manufactured from stainless steel rather than metal to prevent rust.